This book examines gender in post-revolutionary Vietnam, focusing on gender relations in the family and state since the onset of economic reform in 1986. 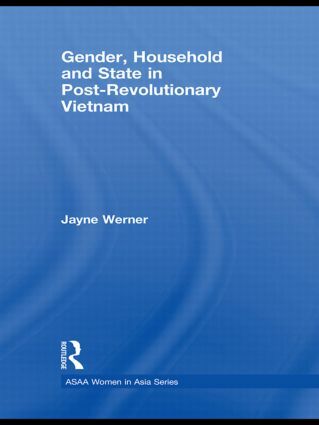 Drawing on a wide range of primary sources (including surveys, interviews, and responses to film screenings), Jayne Werner demonstrates that despite the formal institution of public gender equality in Vietnam, in practice women do not hold a great deal of power, continuing to defer to men in both the family and the wider community. Contrary to conventional analyses equating liberalisation and decentralisation with a reduced role for the state over social relations, this book argues that gender relations continued to bear the imprint of state gender policies and discourses in the post-socialist state. While the household remained a highly statist sphere, the book also shows that the unequal status of men and women in the family was based on kinship ties that provided the underlying structure of the family and (contrary to resource theory) depended less on their economic contribution than on family norms and conceptions of proper gendered behaviour. Werner’s analysis explores the ways in which the Doi Moi state utilised constructions of gender to advance its own interests, just as the communist revolutionary regime had earlier used gender as a key strategic component of post-colonial government. Thus this book makes an important and original contribution to the study of gender in post-socialist countries.